Home » The Wedding Service » Props! I am not into a lot of “stuff” for weddings—the bride and groom are the focal point, after all, and the words spoken—especially the vows—but a well-placed flower arrangement or a table with photos of loved ones can definitely set a tone. However, other, shall we say, props, can offer guests a non-verbal message. Last week I officiated at a wedding at University of Virginia’s chapel. 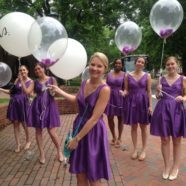 Before the service, women in the bridal party spilled from a van holding huge helium filled balloons. These were props for the beforehand photo taking. Those balloons, though, actually set the tone for arriving guests. They made a statement: BE FOREWARNED. THIS IS A JOYFUL OCCASION. SMILES REQUIRED. 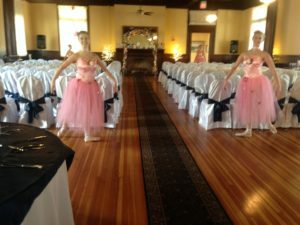 Last year I officiated at the wedding of two ballet dancers who had actually started their own ballet studio! They had arranged for some of their ballet students to pose in costume before the service. These students served as their props. They positioned themselves at the entrance to the room where the wedding would take place, at each end of the three aisles, and on either side of the indoor arbor. It was under that, the bride and groom exchanged their vows. The message here: WE ARE ARTISTS. WE EXPECT YOU TO HONOR THAT ABOUT US. Finally, again last year, I officiated at a wedding at Early Mountain Vineyard. At the entrance to the grand hall where the wedding would take place, the groom/beekeeper displayed his honey. 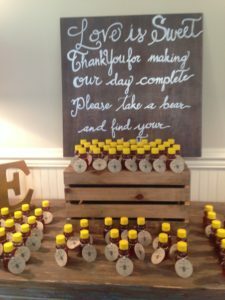 The honey was in little plastic honey bear-bottles, meant, I think, as a reminder of the “sweet” love existing between the bride and groom–a love they extended to their guests by means of the honey bear bottle gifts. The message: LOVE IS HERE! Some good ideas, I hope, to get you thinking about your own wedding!